The outcome of the Andalusian election confirmed the rise of one-year-old radical Podemos (“We Can”). But it also left the Spanish Socialist Workers Party (PSOE) — the main opposition party nationally — as government in a region it has run without interruption since 1982. Such an unbroken run is unique in the Spanish state. Despite a 4.1% swing against it, the PSOE’s 35.4% of the vote left it with 47 seats in the 109-seat Andalusian regional parliament, the same number it already held. The result was a success for PSOE regional leader Susana Diaz. It is already being interpreted by national leader Pedro Sanchez as proof that the party — running third in most national opinion polls behind the anti-austerity Podemos — is on the way back. However, Diaz was helped by the stacked local electoral system. With just 62.2% of the vote between them, the right-wing Popular Party (PP) — governing nationally — and PSOE were awarded 73% of the seats. This masked the degree of erosion of the two-party system at this poll. Diaz called the election one year early on the pretext of “loss of trust” in her minor governing partners, the United Left (IU). This was simply a pretext. Despite recurring tensions within the PSOE-IU administration, the PSOE’s motive was to hold on to its Andalusian bastion while this was still possible — exploiting newcomer Podemos's still incomplete organisation in the region. Podemos won 14.8% of the vote and 15 seats. Although slightly below some poll predictions, it tripled its vote from last year's May European elections to become the third-largest party in the Andalusian parliament. A good part of its success came at the expense of the IU, whose vote fell from 11.3% to 6.9% — and 12 seats to five. Some came from former PSOE voters and many people voting for the first time. Participation in the poll rose 5.2% to 63.9%. In Cadiz, the province with the highest unemployment rate in Spain, the Podemos vote reached 18.9%. The biggest loser was the PP of Prime Minister Mariano Rajoy. It was the most-voted party in the 2012 Andalusian poll with 40.7% and 50 seats. But on March 22, half a million voters deserted the party. Its vote collapsed by a third, down to 26.8% and 33 seats. In 2012, the PP was the leading party in five of Andalusia’s eight provinces. This time it only managed to come first in one. With a system of proportional representation, the PP would have been cut to 30 seats. One part of the PP vote went to the PSOE, as sections of the Andalusian business class moved to back their best guarantee of political stability in the face of the rise of Podemos. Another part was taken by newcomer Citizens, the self-styled “clean and modern party of the 21st century” posing as an alternative to the corruption-riddled party of Rajoy. At its first tilt at Andalusia, the Catalan-based Spanish-centralist Citizens, with no Andalusian party structure to speak of, won 9.3% and nine seats. It relegated IU to fifth position in an Andalusian parliament that now features five parties instead of three. National IU MP Alberto Garzon, the party’s lead candidate for the national Spanish elections and very active in IU’s Andalusian election campaign, described the result as “totally unsatisfactory”. The valuable initiatives introduced by IU ministers in areas such as housing did not save it against the Podemos challenge. However, according to Garzon, “IU remains a force that is indispensable for social transformation”. IU seems certain to be the site of debate over the value of the party’s participation in government in Andalusia. This was always supported by a large majority of its membership, but a minority pointed to the cost of association with the pro-austerity PSOE. 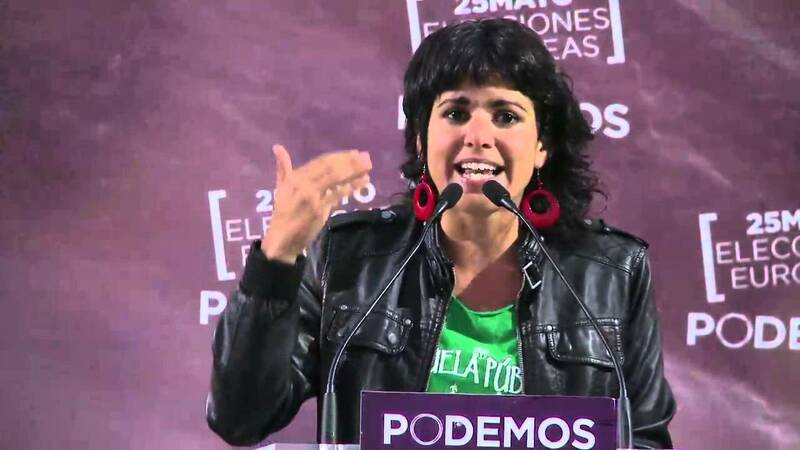 Podemos’s lead candidate Teresa Rodriguez said: “After elections all parties cry ‘Victory!’ Not us. We have won 15 seats in parliament, but we have not achieved our goal because tomorrow the 40 house evictions a day will continue, as will the million Andalusian unemployed and the million children living beneath the poverty line. The dispersion of the vote in Andalusia prefigures the likely result in the rest of this year’s Spain-wide elections. The decay of the discredited PP-PSOE two-party system is multiplying political representation left and right. The Catalan parliament, for example, is likely to be divided among eight forces after September 27. However, underneath this fragmentation lies a shift to the left. Spanish society has been angered by the huge collapse in employment, destruction of public services and seemingly unstoppable rise in poverty and inequality. In the Andalusia elections, the vote to the left of the PSOE (Podemos and IU) almost doubled from 11.3% to 20.7%. With the PSOE included in the category “left”, that vote reached 57.2%, up from 50.8%. At the same time, the vote for the right (PP, Citizens, Union for Progress and Democracy) has fallen from 44.1% to 39%. The PSOE’s intention in Andalusia is to form a minority government, and put the pressure on other forces to support its proposals. However, either the PP, Citizens or Podemos will have to come to the party for this to happen. Citizens has already made clear that it will make any support conditional on Diaz expelling former Andalusian premiers Jose Antonio Grinan and Manuel Chaves, now facing corruption charges, from the PSOE. The PP, which in the face of its own decline has loudly proposed that parties winning a relative majority in elections automatically form government, has so far refused to say whether it will allow the PSOE to form government in Andalusia. After much argy-bargy, the PSOE is almost certain to form a minority government in Andalusia — and the coming struggles in its parliament will have a great impact on Spanish national politics.